The 24 Karat Champagne Wings hit select restaurants today. Here's where to find them. If life isn’t quite luxurious enough for you, there’s a quick way to make any entree or pastry a little bit fancier: Slap some gold leaf on it. While mostly innocuous in terms of taste, the shiny addition adds a touch of class and sparkle to an otherwise, well, probably totally fine dish. Some have taken gilding goodies to the next level, elevating more humble foods with a big of glitz. That was certainly the case when Jonathan Cheban (a.k.a Foodgōd) launched gold wings with the small national chain of bars The Ainsworth. Those wings were soaked in a coconut butter, chipotle, and honey batter for 24 hours, before being fried and finished off with a dusting of gold flakes, and would set you back $1,000 for 50, including a bottle of Champagne. But what good does making a golden version of a common person’s food do if said common person can’t enjoy it? The Lousiana-themed fried chicken chain has launched its own version of the finger food/precious metal mashup. 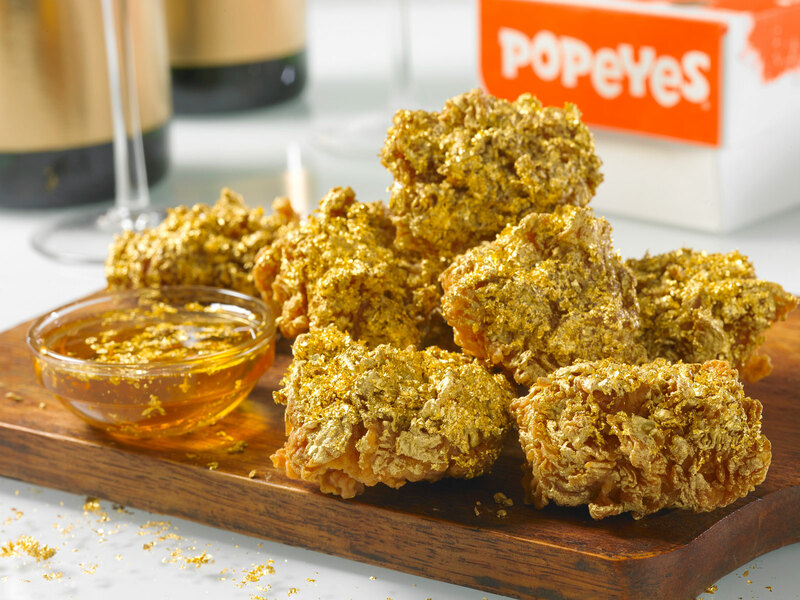 To celebrate the opening of its 3,000th restaurant in Elizabeth, New Jersey today, Popeyes is serving up 24 Karat Champagne Wings for one day only in just four locations nationwide. The boneless chicken wings are hand-battered with Champagne, fried, and then tossed with 24-karat gold flakes. They’re served as part of a Boneless Wing Bash combo, which includes six wings, a side of your choice, and a biscuit, all for just $5. No, that’s not a typo. Five. Damn. Dollars. Who knows? These wings might even be better than their spendier predecessor. After all, Popeyes' chicken is good enough that other restaurants have been caught serving it.